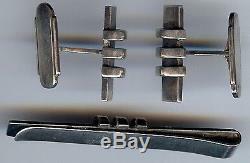 This classy vintage tie bar and cufflink set has sterling silver arches and is signed S. The tie bar has the number 606 and the cufflinks 406 as well as E8M. 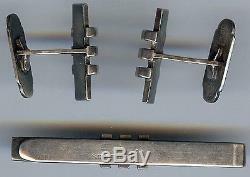 The tie bar measures approximately 2-5/8" by 1/4" in width across the bar and 3/8 across the arches. 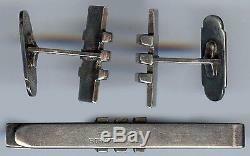 The cufflinks measure approximately 1-1/16" by 1/4" across the bar and 3/8 across the arches. The set weighs 29.5 grams and is in great condition. I have left the original patina for you to polish if you choose. 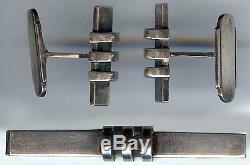 CHRISTIAN DENMARK VINTAGE STERLING SILVER MODERNIST TIE BAR & CUFFLINKS SET" is in sale since Wednesday, September 25, 2013. This item is in the category "Jewelry & Watches\Vintage & Antique Jewelry\Vintage Ethnic/Regional/Tribal\Scandinavian".